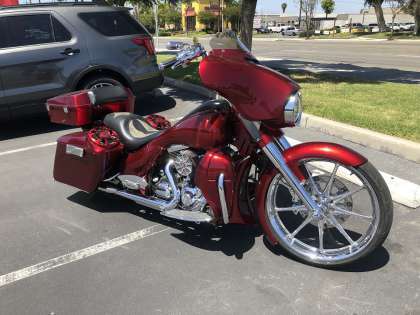 "Vented Style" Gives any year Harley Davidson Road King the Look of a 2014 and NEWER Street Glide!!! The Detachable Fairing ships FULLY ASSEMBLED with inner/outer shell black gelcoat finish *(this Motorcycle fairing is designed to be painted), Polished Stainless Steel Full Length Mounting Brackets (for your model), 12-Volt Accessory Plug, Mounting Hardware & Fairing Locks. Also your choice of Windshield is also included. **Detachable Fairing Stereo & GPS Packages are optional. Bike pictured has HHI 7 degree trees and 7 degree neck with 23" front wheel.